The schoolteacher running Panther was rightly concerned that her AppleWorks documents might not open under Lion—AppleWorks is a PowerPC program, and requires the absent Rosetta, after all. Fortunately, an Apple Store employee was at her elbow, one of a few who was helping her along in a gleeful conversion to the latest version of Apple’s desktop operating system. I was there at Seattle’s University Village, an outdoor lifestyle mall with a modestly sized Apple Store, to scope out Apple’s invitation to Mac owners to pop in and get a cup of Lion to go. From the greeter to my last contact over a few hours Thursday morning, I can say the invitation was genuinely made. While it was business as usual at the University Village Apple Store in Seattle, our correspondent goes about downloading Lion using the store’s bandwidth. As you may know, the latest update to Mac OS X is only currently available as a download from Apple’s Mac App Store. That solution is fine for many users, but others with slow Internet connections or caps on how much data they can download might have problems getting Lion in this way. Apple’s solution? Come on down to the nearest Apple Store and download it onto your Mac using Apple's Internet connection. I arrived not long after the store opened, and told the greeter that my home broadband was too slow (a horrible lie), and could I install Lion in the store? Of course, he said, and directed me to one of several Lion-specific Personal Setup tables, which have power outlets tucked invisibly underneath. Problems surfaced immediately. I’ve had issues with the Mac App Store on both my 2010 MacBook Pro and 2007 Mac Pro. Both machines refused to allow me to purchase, install, or download software after initial successes on both, rainbow beach-balling at any click in Purchases or Upgrades. I solved this on the Mac Pro with advice from regular Macworld contributor Kirk McElhearn. He suggested launching Applications -> Utilities -> Keychain Access, then selecting Preferences. In the Certificates tab, I set OCSP and CRL to Off. These two items are designed to prevent forged or revoked digital certificates used to confirm a valid identity from being used. It’s risky, but disabling that setting enabled me to download purchases to my laptop. The things I do for Apple! I flagged down one of the nearly 40 employees in the store, a blue shirt, and he ran me through a few ideas, including shutting down all programs, and performing a restart. He then booked a Genius Bar appointment for me for 75 minutes later. I turned to Twitter for some help while I watched a stream of MacBook Airs get purchased and set free through the doors. And @yesthatkarim came through, pointing me to Apple forums in which people found a correlation between Spotlight being disabled and the App Store failing. Sure enough, I'd done just that a few weeks before (because the mdworker daemon had been thrashing my processor). I found the right Terminal invocations to turn indexing back on. After a forced reboot, Spotlight was back on and the App Store was responding to my demands. The next hurdle was bandwidth. I don’t know how much throughput each Apple Store has at its disposal, but one assumes that it’s substantial. However, my heart sank when the App Store initially estimated that it’d take three hours to download Lion. There may have been three Starbucks within a block of where I sat—I’m not exaggerating—but sadly there wasn’t a single coffee shop within the Apple Store. Cursing my luck, I suggested opening such a store-within-a-store to an employee who humored me, then found something else important she had to do at the opposite end of the shop. Apple Store staff regularly checked in with me to make sure things were going OK. I passed along my findings about the App Store-Spotlight hiccup, but even the technically minded among them didn’t seem particularly interested in my solution. I think it was off-script, and that can be a problem in the stores, which remain Stepford-Wifely on message at times. But they were polite and even chummy, and cheered on Lion’s download. After 20 minutes, the download sped up fivefold, and finished in a total of 40 minutes. The install took the usual 40-plus minutes: the 30 stated minutes, then the 10 to 15 minutes that “just a minute left” actually reflects. After the Lion Installer completed downloading, I clicked on the Install button, entered my password, and let it proceed. Apple Store staff checked in regularly with me, at least a dozen times over more than two hours, and one more senior staffer came by immediately after the installer began its work, and nearly high-fived me. Employees that I asked said they had a rush of people in on Wednesday to download Lion, but thought it had thinned out. 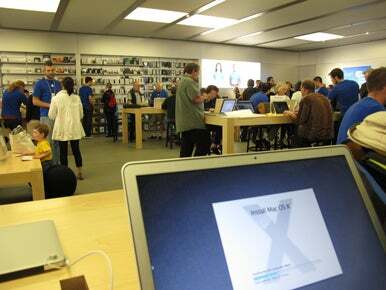 I couldn’t find a single person out of dozens in the Personal Setup part of the store downloading Lion, either. Seattle’s distribution of broadband is uneven, and people with service may have from 1 Mbps to 25 Mbps, depending on neighborhood, provider, and time of day. At 1 Mbps, Lion could take over eight hours to download, but that works fine as an overnight operation. I haven’t spent so much continuous time hunkered down in a computer store since the early 1980s, when I haunted a shop near my house that sold Apple IIs, IIIs, and Ohio Scientific computers. It was fascinating to listen in on contemporary conversations, and watch thousands of dollars of hardware sail out the door in the few hours I was there. Of course, you don’t need to go to an Apple Store to download a Lion installer. It’s not serialized, although it has a receipt embedded in it. You can purchase it in the App Store and forego downloading the installer in favor of getting the software copied from a friend or colleague. Or you can wait and spend the premium for the Apple authorized Lion-on-a-stick. However, I can recommend the in-store installation option if circumstances make an at-home download a no-go. Apple Store employees tend to be unfailingly pleasant, if sometimes a little wide-eyed. One blue shirt skipped through the store at one point, no smile on her face, which was unironic, hilarious, and bizarre, and a nice surprise. Remember to bring your own coffee. Reposted at 1:14 p.m. PT with edits for clarity.